In this video, Dr. Faber and Dr. Keith Kantor, CEO of the program NAMED (Nutritional Addiction Mitigation Eating & Drinking), discuss how diet and nutrition can have a game-changing impact on the lives of those battling substance abuse and mental illness. With 75 percent of those individuals incarcerated in US jails and prisons and recidivism rates easily above 60 percent, the urgency for a dramatic change in diet could never be greater. Substantial changes in diet and nutrition – along with a comprehensive program to rehabilitate the brain – is much more likely to result in greater numbers of people able to successfully battle substance abuse and mental illness and thus alter the course of their lives forever. By eliminating a series of elements from one’s diet, noticeable improvements include weight loss, reduced inflammation, and lower acidity levels found in the body. The elements of a person’s diet that Dr. Kantor recommends removing include sugars, artificial sweeteners, artificial ingredients such as preservatives gluten, dairy, alcohol, and caffeine. 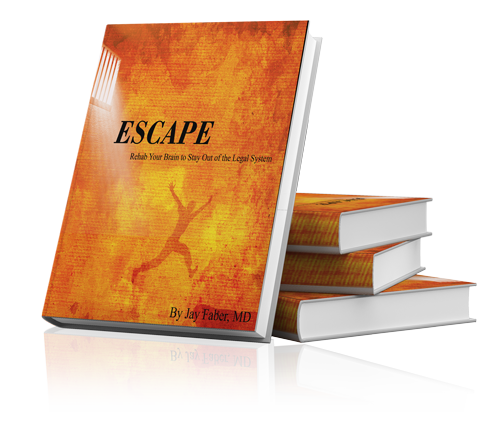 It’s the two-pronged approach offered up by Dr. Faber’s book “Escape: Rehab your Brain to Stay Out of the Legal System and Dr. Kantor’s program NAMED (www.namedprogram.com) that show tremendous potential for turning the lives around of thousands, it not millions of people who follow their recommendations. Please watch the entire video to learn more about their fascinating insights and tips for improving lives.